I really don’t have words this morning. This is the eighth draft I have started for this post. I’ve changed the positivity verse three times, but I just can’t seem to get anything to work for me this morning. You see, I wasn’t able to write a post because I was being nit picky about my wording, about my anecdotes, etc. But really… we don’t need a bunch of “my words” today… all we need is that truth right there. I have been given strength. God, it’s funny… this morning as I write and pray to you, I feel so terribly incapable. But I am just reminded it is because I am so incapable… without You. And, oh God, how often I attempt to function without you. And how often I fail epically because I attempt life without you. 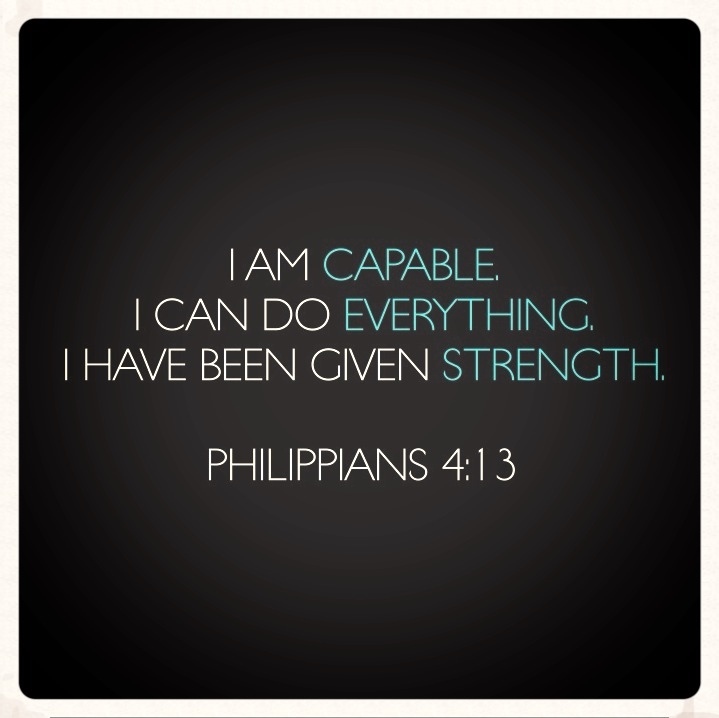 But now… now I remember God that You make me capable. You make me able to do things that seem unimaginable. Sometimes that’s eating right, loving the unlovable, healing over deep hurts… but when I use YOUR strength… I am suddenly able. Today, God, help me to tap into that strength. Remind me over and over again that I am capable with You. That I can do anything and everything with You. That I am strong with You. Help me to triumph today over sin and sadness! You alone are God. You alone fulfill. You alone are strength and hope. May I focus on You. alone.